Hai Yun Jung (b. 1972, South Korea) Lives and works in Korea. Holds a BFA in Oriental Painting from Seoul National University. 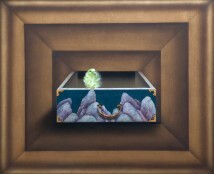 Held solo exhibitions at galleries in Seoul and London and participated in various international group exhibitions, including the 2008 “Korea Now” exhibition sponsored by Artlink and Sotheby’s in Tel-Aviv. Recipient of several awards including The First Prize, Euro Artist Competition, London and a residency in 2010 at the Cité International des Art, Paris.